Well, if you have been following the last few posts, you know that I lost my mother at the end of June. I have been researching my family’s ancestry for 20 years now. My husband told me once that “People die in your family and then you get everyone’s stuff”. Well, that is certainly true for quite a few Great Aunts and Uncles, as well as a cousin who was more like a grandmother-like figure than a cousin. I have been blessed with having many items. A few years back, I began taking pictures and cataloging all the items – who gave it to me, what the significance of the item is, any history of the item, etc. Most of the ‘stuff’ is being utilized in the house or they are photos that have been scanned and the originals put safely away. Then my mother passed away and I have come to a whole new level of realization. Genealogy + Grief = Hoarder? My father wanted to get rid of all her clothes, shoes, etc. as soon as possible. I think that just looking at the items hurt too much. I, on the other hand, found myself putting all those items in my car for safe keeping. We finally made an agreement – nothing goes out of the house without the two of us discussing it. I took quite a few things home. She was a painter – various media – she even taught classes so there are many items still in the house that she created/painted. Where am I going to put them all? Surely we can add an additional room onto the house, can’t we? No matter how much stuff I take/hoard, it won’t bring her back. Period. Wow. I never really thought about it like that. I basically wanted to have everything. Touch everything she touched. Now the shear reality that I have no room or need for most of the stuff really hit home. Since that time, I’ve given items to my nieces – one bought a house last year and one just bought a house over the summer. Some of the items are even my grandmother’s. I didn’t really realize how old they were until I was telling them the story about them. Well, a few months later, it isn’t any easier. I struggle with every item that is in the house because she made most of them. I have decided to catalog all of them and do a few blog posts to document them. After that, it is what it is. 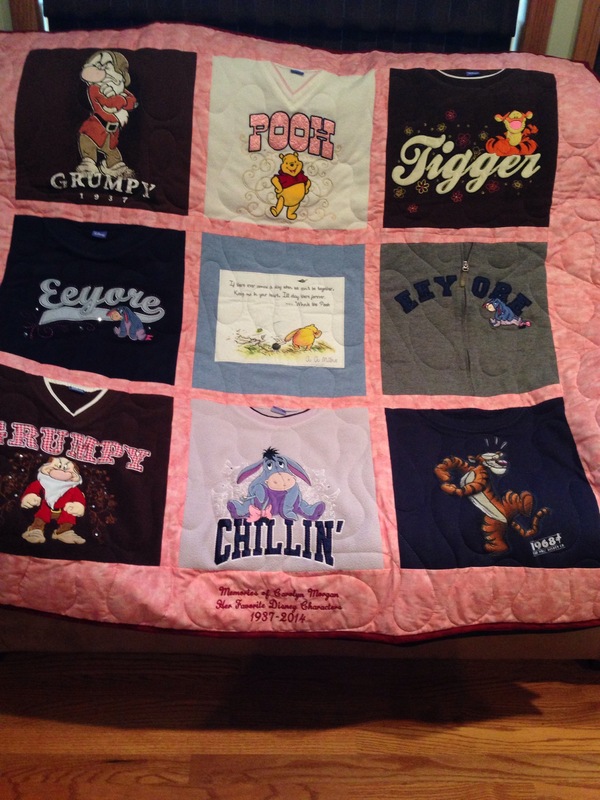 I also had a few quilts made from some of her favorite shirts. My favorite is the Disney quilt, which was all her Disney favorites. She loved Disney, especially Tigger, Eeyore, Pooh, and Grumpy. Now when I am feeling bad, I can look at the quilt or even wrap myself up in it to feel closer to her. This entry was posted in Family, Family History, Genealogy and tagged family history, Genealogy, Grief, Lansing Illinois, Morgan Surname, Researching your family tree. Bookmark the permalink. 12 Responses to Genealogy + Grief = ??? I’m going through this now too. With my own stuff and even my sister in law’s stuff. I know it all has to go, but it hurts. I’m grateful to have a place for the pictures. Thank you Wendy for being the keeper of the flame. I am so sorry to hear this. I must have missed your past posts. I do have some silly things my mom sent me after my grandma died. Mostly her hand potato masher. I already had one, and I kept the one that was grandma’s too. That one sits in a box, in my office. HOARDER is a good word to use for that. Definitely not easy decisions! I understand. I haven’t even mentioned the photos and the silent movies from the late 1960’s! My condolences, it is always a heartache to lose your mother. I think your idea of documenting all your mum’s treasures and artwork and gifting what you can part with to other family and friends is a brilliant way of keeping your mum in the hearts of many. Thanks so much for your condolences and comments. I appreciate them! I love this post! I am a little crazy about the “stuff” too. My biggest fear is that if I don’t keep it…care for it, remember the person who treasured it…who will? I wrote a post on this the other day. Maybe that’s where the fear comes from. I’ve been trying to photo archive mine too, but I have a very strict-inside-my-head-only rule about the dearest things I’ve winnowed it down to–nothing gets sold. It all may be given, but never sold. I don’t know why that makes me feel better. Thanks so much for commenting! It is definitely a dilemma!